Roger Garms, our secretary, has known Sarith since 1990. He tells us here Sarith’s remarkable story of conviction, survival and generosity. The Cambodian School Project started shortly after Sarith Ou’s first return visit to Cambodia in 1994. 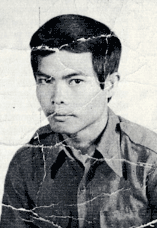 He had been a refugee for almost 20 years, having fled the country in 1975 after refusing to join the Khmer Rouge. Later that year the Cambodian government fell to this brutal communist regime. 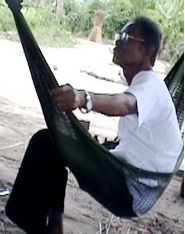 During his 20 years of exile, Sarith had been a guerilla fighter from the Thai border, a refugee, a translator in a refugee camp, a naturalized citizen of the United States, a welder, a graduate of Edgewood College, a bicultural specialist in his local school system and president of the Cambodian Association of Wisconsin. Sarith was able to return because the Khmer Rouge were no longer in power. The Cambodian communists had been overthrown by the Vietnamese in 1979, and had retreated to the mountains, fighting a guerilla war from there. In 1992 the United Nations brokered a cease-fire in this civil war and then held an immensely popular election in 1993. By 1994 it was safer in the cities, but armed outlaws were common in the countryside. Sarith went to Phnom Penh and like many other returning Cambodians, used the free radio announcements to ask for help contacting his family. An old family friend heard the broadcast and contacted his brothers. They came to his hotel to visit. It was still too dangerous for Sarith to go to their homes or visit his sister on the family land more than 200 miles to the north. Ex-Khmer Rouge with AK 47’s would have thought she herself had money had they known she had a ‘rich’ brother living in the United States. She could have been beaten to force her to reveal her imagined gold, or held for ransom. Every year it got safer in Cambodia, and Sarith returned every year to help improve the lives of his brothers’ and sisters’ families. He also began visiting village schools in his home province. He was struck by the poverty of the students and the lack of resources at the schools. Many students owned only the clothes they were wearing. There were few textbooks, no school supplies and attendance was spotty. He started giving away school uniforms and talking to parents to encourage better attendance. As friends back in the states learned of his efforts, they began to contribute. Some helped raise funds by going with Sarith to talk to churches, classrooms and service clubs. 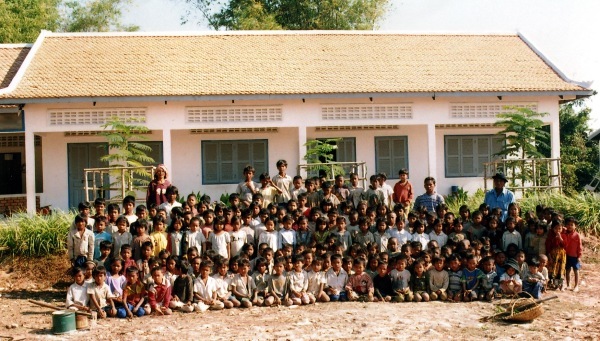 By 2000, this group of friends had evolved into the Board of Directors of the Cambodian School Project. Our goal was to help poor rural schoolchildren and we were incorporated as a non-profit charitable corporation in 2002. Sarith was elected our board president, and has been known as Our Glorious Leader ever since. Sarith’s experience, his knowledge of Cambodia, his contacts there and his unending supply of energy are the heart of our project. He is also a never-ending source of ideas, some brilliant. Sathin Ouk, an early Board member, hearing the latest of many plans, once said, “You have too many ideas, Bong (older brother).” While there may be some truth to that, too many is better than too few. New ideas express Sarith’s unfailing optimism. It is our great advantage to have as our president a person who finds endless opportunity even in the face of grave difficulty. The following is a brief story of Sarith’s life and our project. A more detailed version of his life story can be found in Sarah Streed’s “Leaving the Land of Ghosts.” (McFarland, 2002). Sarith grew up in a rural village founded by his father in Siem Reap Province after World War II. This village of Tampoung is where we built our fourth school. Sarith’s father had been impressed into the Japanese army during World War II. After the war, he and an army comrade left their old civilian lives and moved to the countryside, claiming land that was due to them as veterans. This picture was taken from the road close to Tampoung. It is rainy season, when new rice shoots are transplanted. Almost everyone grows at least some rice near the village. Together with their wives, these two veterans built houses and cleared land for fields. Their farms prospered and other veterans began to settle there. Over the years, a village of 300 families formed. Sarith’s father was helpful to all the veteran families. He answered questions, dealt with government authorities, lent money, settled disputes and helped however he could. He became mayor of the new village. Sarith grew up watching his father govern and help others. Sarith was the youngest of the boys in this large farm family. As village boys did back then, he and his brothers spent some of their boyhood as apprentice monks in the local temple. They learned to read and write from the monks and teachers there, and learned Buddhist history, religious practices and meditation. They cooked and cleaned for the monks. As a teenager, Sarith moved into the temple and became a monk. 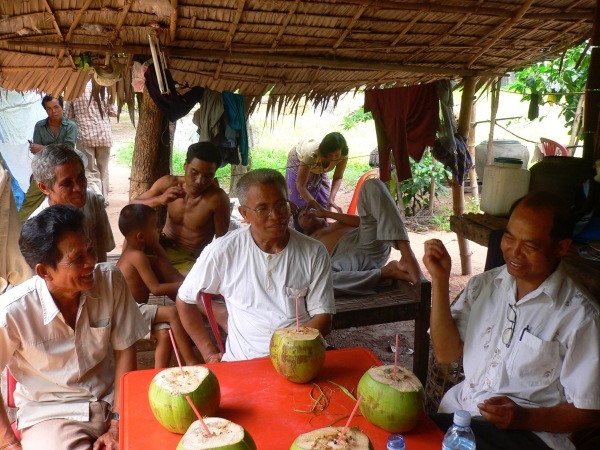 It was typical for young Cambodian men to spend several years as monks before going on with secular life. A good student, Sarith became a teacher for the younger boys as he followed the old temple traditions. In the outside world at this time, the civil war was building. The Americans were bombing to suppress this communist rebellion. Beyond the sanctuary of his village temple, Cambodia was falling apart. In 1970, the royal government fell to a military coup. With growing civil war, the Khmer Rouge, led by Pol Pot, had become stronger and were now infiltrating the countryside. By 1971 they were often seen in the village and on the grounds of the temple where Sarith was teaching. This meant the village was a target for bombing. The Americans were dropping millions of tons of bombs on the countryside in support of the government. The Khmer Rouge claimed to represent the peasant class who had been exploited by the king and upper class for generations. As the bombing increased, many people found their Marxist rhetoric compelling and they grew stronger. There were other difficulties. The new military government was just as corrupt as the old royal government. This was no surprise. Like many other idealistic young Khmer, Sarith hoped the message of the revolutionaries was true – that they would create a just and equitable government. He considered joining these radicals, and began to spend time with them. Six months later, despite their efforts to recruit him, he was completely disillusioned. Not only were the Khmer Rouge not helping the poor, there was complete confusion and mismanagement at the local level. They weren’t helping anybody. They also were not living their ideals. Despite the Marxist rhetoric, there clearly was a hidden central control that was calling the shots. Sensing a dark purpose behind this massive deception, Sarith left the Khmer Rouge. He couldn’t go home. The Khmer Rouge now controlled his village. Having refused their offer to join them, he was now the enemy. He could not go home - he would be killed. He had to leave their sphere of influence. He went to his uncle, a colonel at an army base close to Thailand. At his uncle’s urging, Sarith became an employee of the government attached to the army. Over the ensuing months he became a commander of several hundred men, and paymaster for the post. From this position, Sarith began to see how things really worked in this army. The officers were getting rich by withholding part of their pay from the men, who had no recourse. No wonder the army was losing. By April of 1975, the US was pulling out of Southeast Asia and the country was falling to the communists. His uncle urged Sarith to surrender with him. He was sure they would be safe because the army was “under the protection of the king.” Sarith did not think so. He told his uncle about his own experiences with the Khmer Rouge, that they had no loyalty to old institutions, and urged him to flee to Thailand. His uncle refused, and Sarith left for the border. A few days after crossing, he got the news; all 106 officers at the post, his uncle included, had been executed by the Khmer Rouge. He learned, in his forays back into Cambodia that the Khmer Rouge had no opposition. The Cambodian army was on the run or dead, and the communists were killing as many former soldiers as they could find. They had no real opposition. Sarith’s group’s materiel support dried up as the hopelessness of their position became clear to the Europeans. After almost two years as a guerilla fighter, Sarith realized that rescuing Cambodia was not possible. Only time would change this grim reality. He left the guerilla army and entered the refugee camp. Cambodia by then was in chaos. Sarith was good with languages (he did learn Thai), and became a translator for newly arrived refugees. They told terrible stories of this chaos. The Khmer Rouge were killing all of their enemies, real and perceived: former soldiers, police, government officials, teachers, lawyers, doctors, people with soft hands, people with glasses – they were killing the entire middle class. Old scores were being settled and deadly lies were being told. As they were annihilating the middle class, they were placing the working class in slave labor camps. The guards in these camps were treating them brutally. The Khmer Rouge were in total control and could kill whom they wished, and thousands were dying. The communists had support from China and from the deposed Cambodian king, who had been living in China since the coup. There was little hope for a military or political solution in his country. The guerilla army dissolved and Sarith went on with his life. He married a young woman in Thailand who was ethnically and culturally Cambodian. They started a family, having two daughters. Responsible now for others, Sarith had to make some long-term decisions. It was clear that there was no possible future in Cambodia. If he returned there, he would have the same fate as his uncle. The family signed up for sponsorship to America. Meanwhile, in the slave labor camps they created, the Khmer Rouge established farms and undertook huge dam and irrigation projects. These were poorly engineered and often failed. 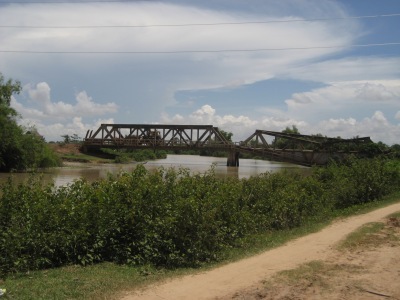 Here you see an example of Khmer Rouge engineering, the bridge on the highway to Thailand, 2 km. downstream from our first school at River Village (Poum Steung). This bridge was on the highway to Thailand. For some reason, the communists wanted to blow it up. When they set off the charges, the superstructure was damaged but the bridge itself remained quite usable. Apparently they then gave up on the whole idea and the bridge continued to be used for over 25 years.. It has now been replaced with a modern structure. ‘Pol Pot Time’ is over. It wasn’t just mismanagement of demolition that marked this regime – management failed in almost every way. Rice was sold to their ally China despite famine and starvation at home. The slave laborers began to starve, and many got sick. By then, the hospitals were closed, the doctors were dead and there was no medicine. The slaves became too weak to work with any efficiency and the projects they were assigned were poorly conceived and managed about as well as this bridge was blown up. The Khmer Rouge envisioned a peasant paradise. Instead they killed two million of their own people. 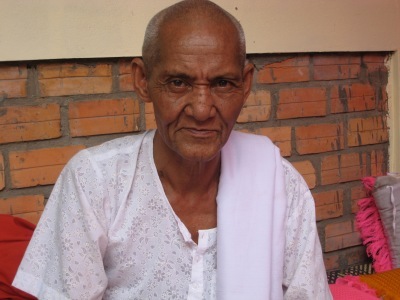 Sarith and his family were in the Thai refugee camp during ‘Pol Pot time’. In 1979, Sarith and his family were flown from the camps to be resettled in Cambridge, Wisconsin, in the northern Midwest of the United States.. The family was sponsored by Grace Lutheran church there. One of Sarith’s sponsors from that church, Tom Watson, is now on our board. Sarith (of course) decided he’d better learn English. He studied it at night and worked as a welder during the day. Meanwhile, in 1984, the civil war was still going on in Cambodia, even though the Khmer Rouge had fled to the mountains. 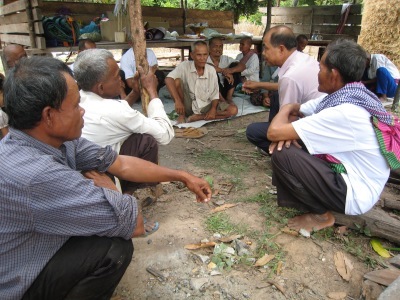 The Cambodian refugees in the Thai camps could not return home and began to be resettled in other countries. Many began to enter the United States. Some were sponsored by churches in Madison and Janesville, Wisconsin. These refugees and their children were completely baffled by the American school system, so different from the much more authoritarian schools they were used to. Sarith took a job as a bicultural specialist with the school system in Madison, where he now lived, serving as a culture broker for Cambodian families. He mediated disputes, helped resolve cultural differences and was on call for every crisis – much like his father had been. 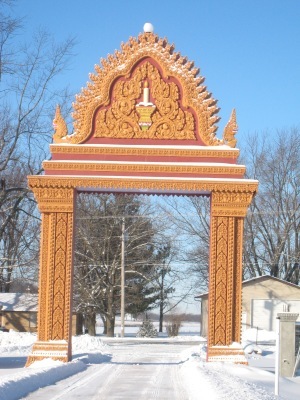 Sarith helped found the Cambodian Association of Wisconsin and served as their president... He also served as president of the board of United Refugee Services, the local Southeast Asian mutual assistance association. Gray Williams (now on our board) was director of this organization. It was the main support for the hundreds of traumatized Southeast Asian refugees, Hmong, Lao, Cambodian and Vietnamese. In 1990, Sarith helped Roger Garms (also on our board and author of this bio) start a support group for local Cambodian war veterans with post-traumatic stress. This group was expanded and another was added when the local mental health center began serving Cambodian refugees. Sarith was asked to serve on the Board of Directors of the local mental health center. He advocated successfully for more mental health services to Cambodian holocaust survivors. These services continue more than 25 years later, as Journey Mental Health Center sponsors two support groups at the Cambodian Buddhist Temple and provides casework and psychiatric services as well. In 1992, with a $10,000 grant from the Madison Community Foundation and another $10,000 from Sarith (he took out a second mortgage on his house), the Cambodian community got a land contract on five acres of land south of Madison. Led by Sarith, they were getting it ready to house a Buddhist monk from Cambodia. The veteran’s group cleared the land, fixed the well and updated the old farmhouse on it to make it livable. Sarith appealed to the chief monk of Cambodia to send us a monk. The Venerable Seng Soy proved to be a wonderful choice. He is still in residence, now an American citizen with a good command of English. A second monk from Cambodia joined him two years later. He too is still there, has good English and is also now a citizen. As an anchor and support for Buddhist and Cambodian culture, the temple is a powerful support for the many Khmer who find it difficult to adjust to our modern individualistic culture with many values incompatible with their own. It has beome a center not only for Cambodians in Wisconsin, but from surrounding states as well. gotten his degree in political science from Edgewood College. In Cambodia, things had improved. The Khmer Rouge had been driven into the mountains and jungle by their old mentors the Vietnamese. They waged years of guerilla warfare and kept up the civil war, but they no longer controlled the country, and the slave labor camps were empty. Their army declined, supplies were short and by the early 90’s, the Khmer Rouge were looking for a way out. Fortunately, the United Nations was able to find a solution. In 1993, with the UN brokered peace, soldiers turned in their guns and an election was held. The long civil war and holocaust wound down. The refugee camps were emptied and people in them were finally able to return to Cambodia. By 1994. it was possible to safely travel in and around the cities. Mines and desperadoes made travel elsewhere difficult. On his first trip back Sarith was afraid he might find none of his family alive. Sadly enough, he learned that two of his sisters and their children had been killed. His parents were also dead. His baby sister had been lost in the chaos decades ago. Two brothers and one sister had survived, along with their families. Here you see Sarith, one of his brothers and his nephew some years later. As we said above, when he first learned that his sister was alive and living in their old village, he could not visit her. After years of civil war, there was no law out in the country. If armed ex-Khmer Rouge learned that she had ‘rich’ relatives living in America, his sister would surely have been robbed or held hostage for ransom. The second year when it was much safer, he was able to go out into the countryside, visit family and he began to visit some local schools. There were not enough schools, they were in terrible shape and children attended only sporadically. On later visits, he began to talk to the parents about the importance of literacy and to give out school uniforms to encourage school attendance. Given that most children had only the clothes on their backs, such gifts were not trivial. Attendance improved. Roger (now on our board) and Tom, one of Sarith’s sponsors from Grace Lutheran (who is also now on our board) began to contribute. Other friends joined in. Sarith told his story at local churches, and appealed for school support. We all recruited more friends and relatives. Contributions steadily increased. More uniforms were given away each year. Finally, in 2002, we had enough in contributions to actually build our first school. Here is Pran, Sarith’s other brother, who found the poorest village in the commune as a site for our first school. Pran made sure all the construction was done properly and all the money was counted precisely. This gave our project good local credibility. Not only were we distributing money fairly, but we weren’t letting anybody cheat us or do shoddy work. The project went well, coming in on time and on budget. When our first school in Poum Steung was finished we immediately had 200 students. We gave them all new uniforms and classes started. Sarith’s nephew Thai was made the principal of the new school, insuring continued oversight and honesty. Sarith visited every year and Roger most years. Over the first year, we had no dropouts. Over 90% of our students now graduate and ¾ of them go on to high school. We have since built two additions, a kitchen and bathroom. Other NGOs have funded a library and two large classroom buildings. We partnered with the village to buy some land next to the school for playground space and gardening. The trees Sarith planted, seen just behind the students here, now shade the whole schoolyard. The stories of the other schools Sarith led us in building are similar. We discuss them in more detail under the tab Schools. In 2009 Sarith retired from the Madison school system and was able to move back to Cambodia. From there, he is responsible for culture brokering, representing our board on the one hand and local needs on the other. In 2012 he and Roger were awarded the Dane County, Wisconsin, United Nations Global Citizen Award for their work on behalf of rural Cambodian children. Our President of the Cambodian School Project has been mainly responsible for building five grade schools and one technical school for young adults for the Cambodian School Project. As a private individual, he has also brokered the construction of three grade schools funded by others. His modest project some 23 years ago, helping poor rural students stay in school and become literate, has affected now thousands of grade school kids. Hundreds of young adults have been trained and placed in good jobs in our technical school. One of Sarith’s many ideas has resulted in a climate-change project, catching rainy-season water for use during the (now extremely) dry season. He and Roger have on their own begun to work on this, financing the excavation of an old creek bed downstream from a recently built dam. 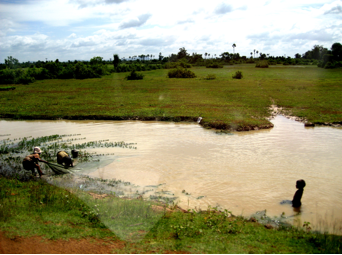 This is a new chapter, helping rebuild the small reservoir that serves Sarith’s childhood village and two others near it. We will add to the story as it is written.